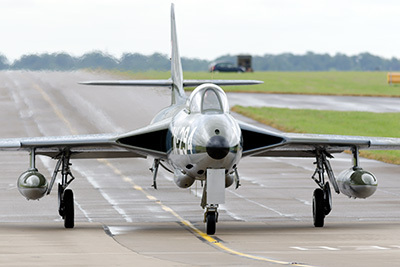 Hunters, being produced in huge numbers and being a basically simple aircraft, have survived in large numbers, with many airframes preserved throughout the UK (and plenty elsewhere). Many are in flying condition, and a number appear at airshows regularly. The list here is compiled from a large number of sources, with particular credit to Bob Dunn and the Wolverhampton Aviation Group, Roy Blewett and the contents of Ken Ellis' Wrecks & Relics (16th edition) and Otger van der Kooij's European Wrecks & Relics (2nd edition). However due to the difficulty of finding out some of the information and the swiftness with which Hunters seem to change hands, I have no doubt there are errors and omissions in the listing. If you have any changes please add a comment to the appropriate entry or entries. This list is somewhat out of date - I'm slowly working through it and updating it where I know things are wrong, and adding larger photos to many entries.